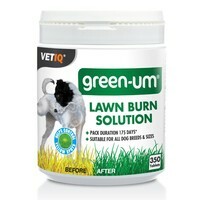 VetIQ Green-UM Lawn Burn Solution Tablets for Dogs can be used to prevent lawn burn. Green UM has been specially formulated with a natural plant extract, which helps bind the ammonia present in pet waste. VetIQ Green-UM Tablets are a totally natural product which can be given to your dog on a regular basis and will help keep your garden lush and thriving. VetIQ Green-UM Tablets neutralize the potential for high pH urine that can damage grass. By feeding Green-UM the pH of the dog's urine should fall within a level that does not contribute to lawn burn. Use Green-UM tablets with a protein controlled diet for best results. I have been using this product for years - German shepherd, poodle and terrier. Excellent results. One tablet needed per 10kg of body weight. I won’t have dogs on my lawn who aren’t using this product as my grass is ruined if another dog pees on it. I have recommended this to many friends, who all agree it is excellent. Must use daily. I don’t use during the winter months when there is sufficient rain on the grass to dilute the pee. April till November is a must! Just stick the correct number of tablets in the food and they eat them straight down. Easy to use as we just put it in with the dog food. However, we have used it for the past month and not seen any difference in our lawn. The burns are still happening. We had high hopes for this product, but alas it was not to be for our two springers.